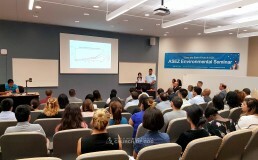 On July 31, 2017, a seminar on environment was hosted by ASEZ as part of the “Mother’s Street Project” at George Mason University in Virginia, USA. This seminar was to find the roles of college students to fulfill the Sustainable Development Goals [SDGs] and pursue the welfare of mankind. 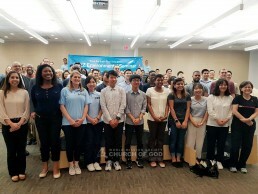 The 90 ASEZ members from Korea and from Washington D.C. shared the seriousness of environmental problems and talked about action plans. The seminar started with the opening speech of the leader of ASEZ Washington D.C. Branch, which was followed by the reports of the ASEZ members on the seriousness of environmental problems and the future of the Earth. This report was planned, based on the fifth report of United Nations Environment Programme [UNEP]. The members explained that the most necessary thing in this age is to change our action, and emphasized the responsibility of mankind for the Earth, the only planet with living organisms. Carol LeBlanc from Climate Reality Leadership Corps gave a speech, where she asked the question, “Can we change? Must we change? Will we change?” and explained the roles of college students and the importance of their change in this age when global warming is getting worse due to environmental pollution. August Kruesi, the technical principal for aerospace at Aerojet Rocketdyne, went up to the platform after Carol LeBlanc and delivered a speech on the challenging spirit that students, who are standing in the center of the future generation, should have.